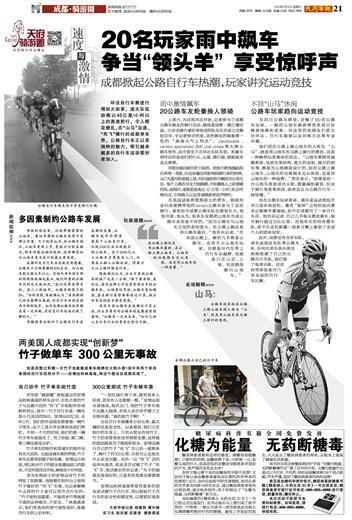 Chengdu Daily is an English-language newspaper in China started in October 1999 and owned by Shanghai United Media Group. Its primary audience is expats living in Chengdu, visiting foreigners, mainly overseas investors and tourists, and local white-collar workers proficient in English. Many Chinese students also read it to improve their English. It is the only English-language newspaper that is published seven days a week in Mainland China. Larry and Jacob from the Natooke Chengdu team both realize their dreams of building a bike frame out of bamboo, thus making the production of bikes more envirmentally friendly.